On Monday, yesterday night, we saw the talk that Jack Ohman gave at the Oregon Historical Society. That wonderfulness will be for the next missive. Before we entered the building, of course, the surroundings on the Park Blocks, at SW Park Avenue and Madison Street, caught my attention, and I was, of course, smitten. Aw, you know how I do. 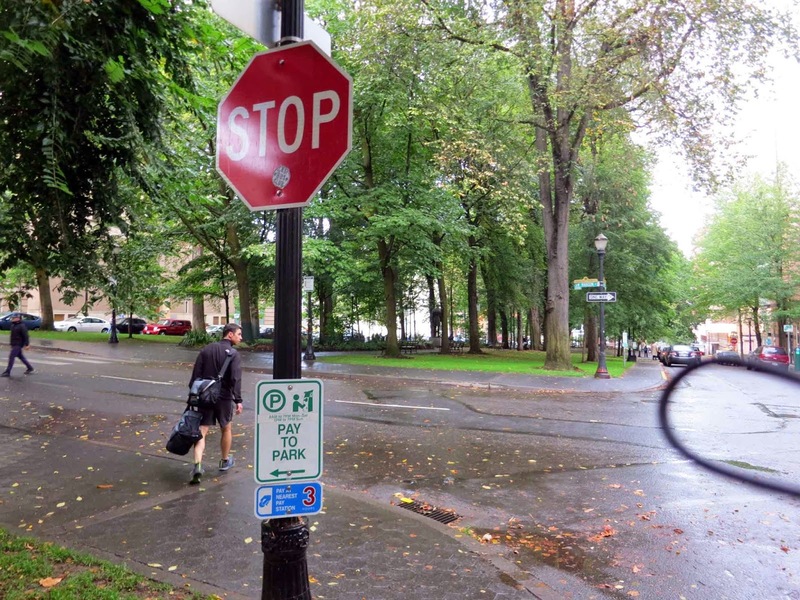 There are two sets of what we call 'Park Blocks' in Downtown Portland. 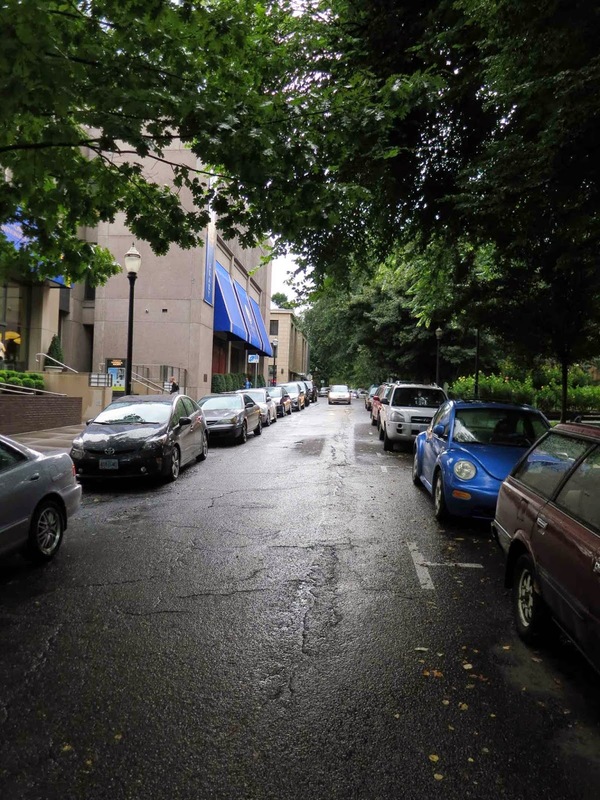 The north wing starts at West Burnside and runs north between NW Park Avenue and 8th Avenue until one block south of the Main Post Office on NW Glisan. The south wing runs south from SW Salmon beween SW 9th Avenue and SW Park Avenue into the Portland State University campus. The newbie to Portland would probably figure that the pattern of these skinny blocks, only 100 feet wide to the standard 200-foot Portland city blog, running to within a block south of Burnside then jogging as it crosses Burnside to continue north, meant that they were all meant for greenspace, and that newbie would be right. But early Portland business dynasties didn't always give stuff away, and as a result, the blocks north of Salmon and south of Burnside went mostly over to business. Some takeback is occurring; the space known as Directors Park used to be mostly parking. I don't expect to see a greenspace connecting to north wing to the south wing even within my lifetime, so this will have to do. The history also makes the nomenclature a little tricky. When originally planned out, the South Park Blocks were bounded by streets called West Park Avenue and East Park Avenue. Today, north of Salmon, what was West Park is known as SW 9th Avenue. south of Salmon, both sides of the Blocks are bounded by SW Park Avenue, West Park apparently becoming 9th Street, then SW 9th Avenue, as development occurred. So much for all that. Back to the pictures. This is the South Park Blocks, looking north from SW Park and Madison. It's easy to see how the narrow block makes a green corridor. The two wings of Park Avenue on either side are very narrow, even for Portland downtown streets, so the area feels very cozy. 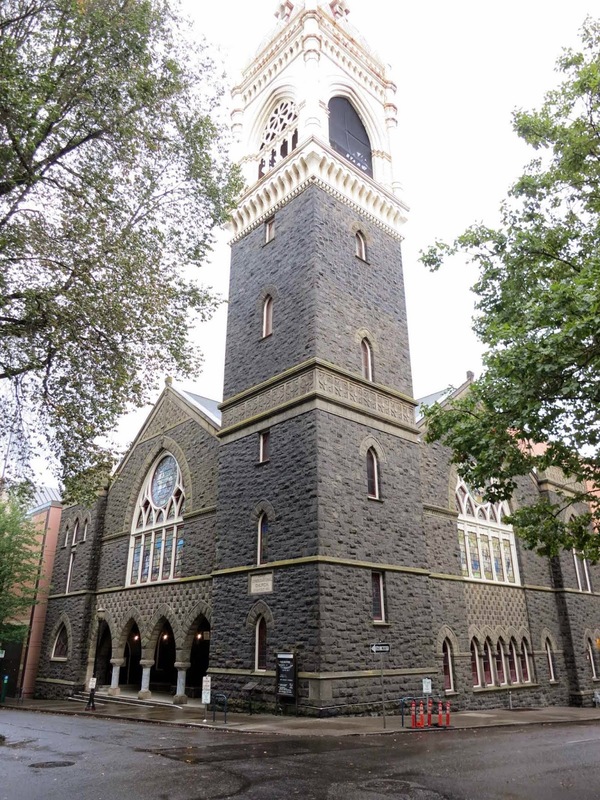 That edifice above is the First Congregational Church, whose construction was completed in 1895. A United Church of Christ congregation is headquartered there modernly. The top of that campanile is about 175 feet straight up. It's an imposing building but not without a certain comforting weight and presence. 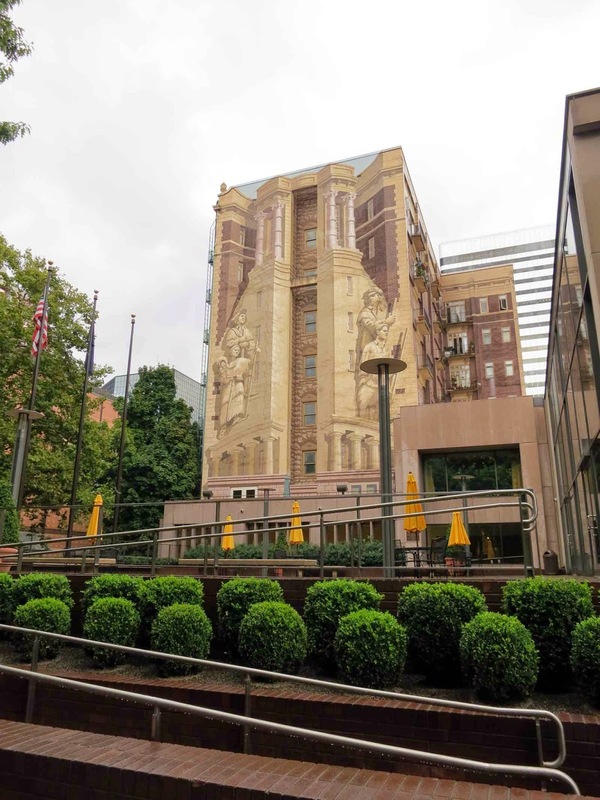 Between the new main lobby of the OHS and the corner of Park and Madison there's a courtyard, and overlooking the courtyard is the west side of a building called the Sovereign Hotel, a building that the OHS also owns and is on the Historic Register. The optically-illusory painting on this building face has entranced me for a long time, and it's so well-done that you really think it's a feature of the building. The French have a word for it: Trompe l'oeil (pronounced, approximately-enough for the English tongue, trump-loy). Literally, 'trick of the eye' or 'to trick the eye', it is exactly that … it delights the eye by fooling it into seeing something that's not there. In this case, by decorating up what would otherwise be a bland, flat building side into something that truly does delight the eye. It pulls a foolie on you … but you appreciate the joke.